Reduced to clear! (normally $19) BP-MB45R2I. 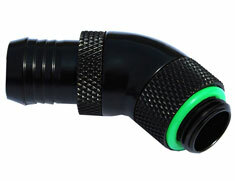 Bitspower G1/4in Matte Black Rotary 45-Degree 1/2in Fitting.